Most flooring that needs to be stripped will be obvious. It will be either yellowing, dull, un cleanable, etc. Stripping is done by a series of steps. With the proper equipment, chemicals, and know how. 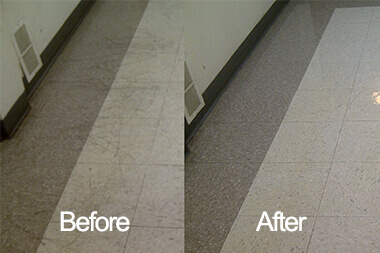 We at Hands-On Cleaning can help bring back the shine of your VCT, Laminated & Vinyl Floors. Usually done on weekends so not to interrupt your already busy schedule. VCT is short for vinyl composite tile. This is the type of floor that you see in most hospital hallways and many other commercial buildings. Some people just call it "tile" floors! Stripping and waxing is a term that refers to removing the existing wax on your floor and applying new wax. Wax is also referred to as "finish" and these two terms are interchangeable. Stripping is a labor intensive process where low speed buffers (floor machines that run 175 rpm) are brought in and remove the wax. First, a mop is used to apply stripper, which should be allowed to sit for ten to fifteen minutes. Then, the low speed buffer is run over the floor with an abrasive pad for stripping. The result is a combination of old wax and stripper that is then vacuumed or mopped up. This process is repeated until all of the wax is removed. Once the floor is stripped, the floors should be rinsed once more to remove any loose remaining wax or particulates, and ensure a clean floor to wax. The floor must then be allowed to dry completely before any wax can be applied. Wax is applied in coats. The first coat is applied by a mop and allowed to dry. Then each additional coat is applied. Depending on the specifications and desired shine, the number of coats of wax is determined. After the above steps are completed, your floor is now stripped and waxed. Buffing or polishing refers to using a high speed buffer on the VCT floor to bring back a shine and make the wax harder. High speed buffers run between 1500 rpms and 2000 rpms depending on the manufactured. Mopping should be done with cold water and a neutral cleaner. If hot water is used on a waxed VCT floor, it can cause the wax to come up with the mop and also gives the wax a cloudy appearance. Also, do not use harsh cleaners to mop a VCT floor. Bleach or ammonia based products will strip wax off of the VCT floor. If you cannot find or run out of neutral cleaner, just use plain cold water. Then, find a suitable neutral cleaner when you resume the maintenance the next day. Sweep and mop your VCT floors daily. High speed buff your VCT floors at least once a month. Strip and wax your VCT floors at least once a year.